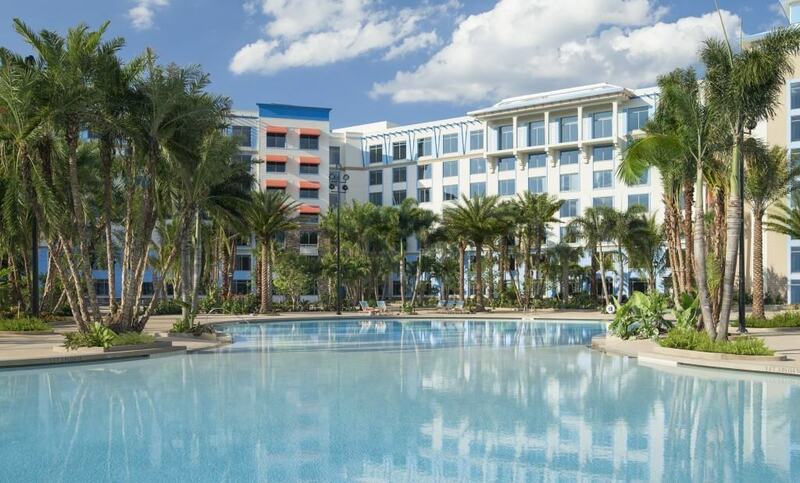 One of the many perks of staying at a Universal Orlando on-site hotel is the chance to enjoy the amenities at all six resorts, no matter whether they fall in the category of being premier (Portofino Bay Hotel, Hard Rock Hotel, and Royal Pacific Resort), preferred (Sapphire Falls Resort), or prime value (Cabana Bay Beach Resort and Aventura Hotel). With this benefit, you can take a break from the theme-park craziness by strolling the hotels’ immaculate grounds, feasting in all their fantastic restaurants, or, in our case, taking a dip in any one of their nine luscious pools. On our recent vacation to the parks, we managed to visit all the main pools at all of the on-site hotels. In retrospect, the pools may have just been the highlight of our stay, especially for our theme-park-adverse teenage son – they all have plentiful lounge chairs, many with umbrellas for those seeking relaxation without sun, and the towel centers not only provide fluffy towels, they also have complimentary pool noodles, sunscreen, swim diapers, and ice water. 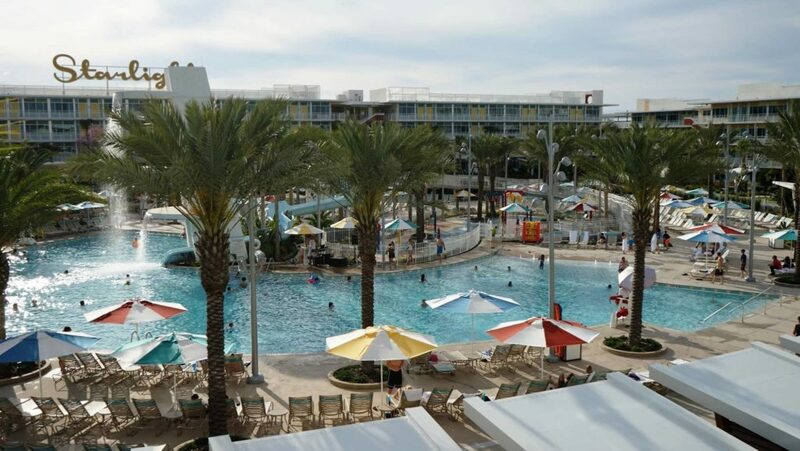 The difference between a visit to the average rectangular hotel pool and the experience at Universal’s pools is like comparing plain, unsweetened yogurt to strawberry-cheesecake frozen yogurt! 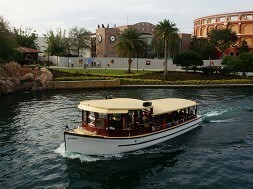 We checked in to Royal Pacific Resort early Monday morning and proceeded to Universal Studios Florida. After a full day of touring the park while waiting for our room to be available, we were ready to spend the evening by the pool. What a wonderful pool by which to relax! 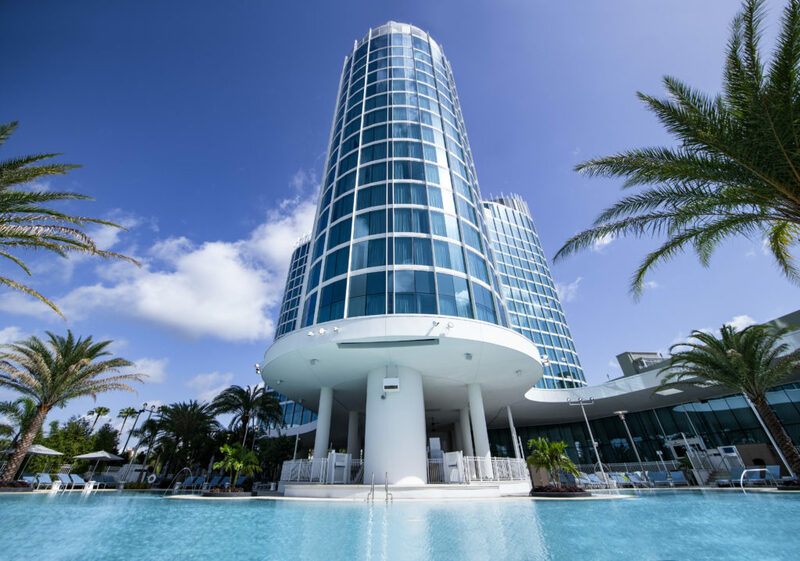 We found the Royal Pacific pool vibe to be the most tropical (though Sapphire Falls Resort’s comes in a close second), and it offered both ice water and citrus-infused ice water in multiple locations. It was lovely to be able to get a cup of cold water so simply. There is a small zero-entry area near a delightfully enclosed toddler pool and sandcastle-building site. The chairs across from the sloped entry are seated in sand, but most of the area’s chairs were on concrete. My kids quickly found the volleyball net stretched across a gooseneck in the pool. They played water volleyball for hours with a variety of different opponents. There is a beach volleyball court, too, located just beyond the pool gate that leads to the Garden Walkway. The field of play is somewhat sloped towards the water, so the ball often headed into the lagoon. My kids joined a game in session; however, the volleyballs can be checked out at the towel center using one’s room number. While our more energetic teens checked out every game on-site (a table tennis game was next on their agenda), my husband and I soaked up some relaxation and daiquiris. Royal Pacific’s poolside interactive play area was a bit young for my teenagers, but it got plenty of use by other kids while we were there. The restrooms are located near the play area, and it took some care to keep from being sprayed on the journey there and back. The small building houses two single-stall bathrooms, and it’s nice that the restrooms are not overly cold or located inside the main air-conditioned building. Later in the day, the pool staff set up an outdoor screen for the nightly “dive-in” movie while we enjoyed supper; the Bula Bar and Grille offers a variety of snacks, light meals, and beverages all served up by friendly wait staff. All in all, the Royal Pacific Resort pool really was the perfect end to our first day at Universal Orlando. Tuesday, we took advantage of the early entry into The Wizarding World of Harry Potter. With pool-hopping in mind, we headed to the parks with a bag packed with sunscreen, swimsuits, wet bags (purchased online, marketed for diaper bags or gym members), and a couple of good books on my Dry Pak-encased Kindle (what is a Dry Pak? It’s a waterproof bag for electronics). We stashed our bag in the lockers outside Islands of Adventure so we would not lose any time once we were admitted into the park. After a trip to Hogsmeade and lunch at Mythos, we retrieved our bag and walked to Hard Rock Hotel. The walk was a bit longer than the one to Royal Pacific Resort, but it was lovely, nonetheless. We made use of the restrooms near the exit to the pool area to change into our swimwear and then headed back out into the sunshine. Although the main pool gate had a key card reader, a member of the pool staff opened the gate for us upon our approach. Just inside the gates, we picked up towels at the towel center and headed around the pool to find some chairs under an umbrella. Most chairs at the Hard Rock pool are situated on sand, and the majority of the pool features a zero-entry slope into the water. The activity director kept the under-ten crowd busy with rounds of hot potato (or get-rid-of-the-beach-ball) and rubber ducky hunts. My teens found the beach volleyball court and spent enough time there to scald the bottoms of their feet. 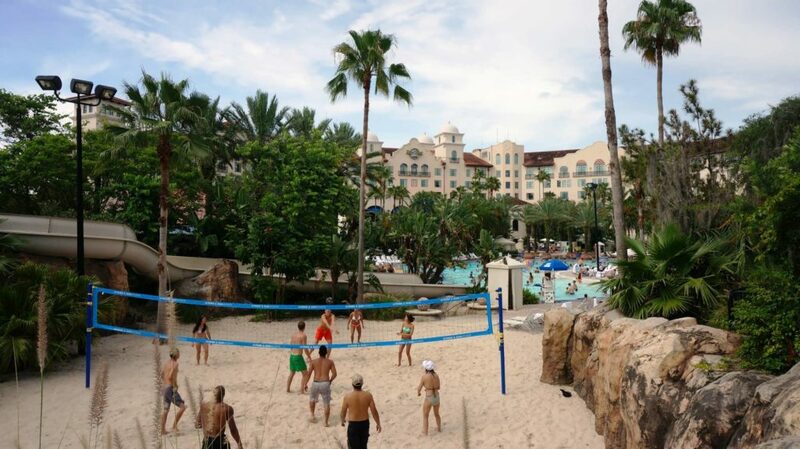 At the Hard Rock pool, the volleyball court is a small area just beyond the pool slide. My son loved that it was so easily accessible; I loved that it was in sight of the pool. 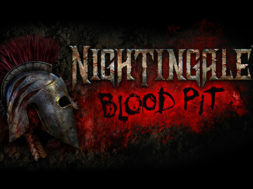 The fact that it had a near-constant game going was also a point in its favor. My daughter loved the water slide – after the slide’s slow start, it seems a bump midway livens things up. One set of restrooms is located to the right of the bar (imagine air-conditioned, standard-issue bathroom stalls). Between the restrooms and bar, there are two pool tables. The wait staff here was ever-vigilant, and the drinks were great. The fruit bowl was droll-worthy, but we headed out before hunger struck, so we did not try the food poolside. However, we did try the hot tub! Our kids wanted to join us, so we skipped the adult-only one. After we’d had our fill of sun and great music, we rinsed off at the outdoor shower just next to the hot tub, gathered our things, and changed in the restrooms inside. Our swimsuits safely ensconced in our wet bags and our hair pulled back in ponytails, we walked out the pool gate to head back to Islands of Adventure. The pool bag went back in the locker (since we answered “no” to the inquiry “is this your final time retrieving your items?” when we grabbed the bag earlier), and we proceeded to dry our hair on The Incredible Hulk Coaster. 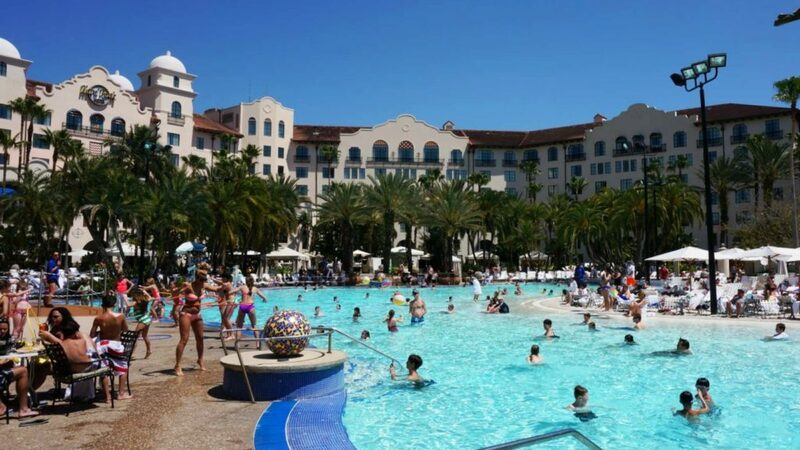 On Thursday, we had our chance to check out the Portofino Bay Hotel pool after a tour of Universal Studios Florida. 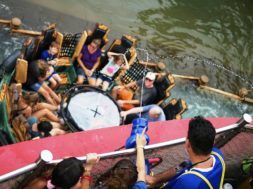 Once we slayed our quota of aliens at Men in Black: Alien Attack, we grabbed our pool bag and made our way to the water taxi dock – knowing that Portofino Bay was further from the parks than Hard Rock Hotel, I convinced my family to take the boat. After arriving at the Italian waterfront dock, we followed the signs to the Beach Pool, which took us up a flight of stairs and down a second set to the pool gates. We changed into our swimsuits in bathrooms to the left of the towel center. Fluffy towel pick-up was accomplished just in time for an afternoon rain shower to break, so we ducked under the covered bar seating area and had a snack. Once the sun popped out again, we found chairs under an umbrella. Portofino Bay’s Beach Pool offered cushioned lounge chairs that managed to remain dry despite the rain. The pool was deeper than the others we had visited thus far, although not by much. The water slide received a thumb’s up from my daughter. My son played table tennis in the absence of a volleyball court. I loved the hot tubs here, which featured rock walls with waterfalls – that is, waterfalls of hot water. Brilliant! The afternoon was more shade than sun, and we sat out another shower. 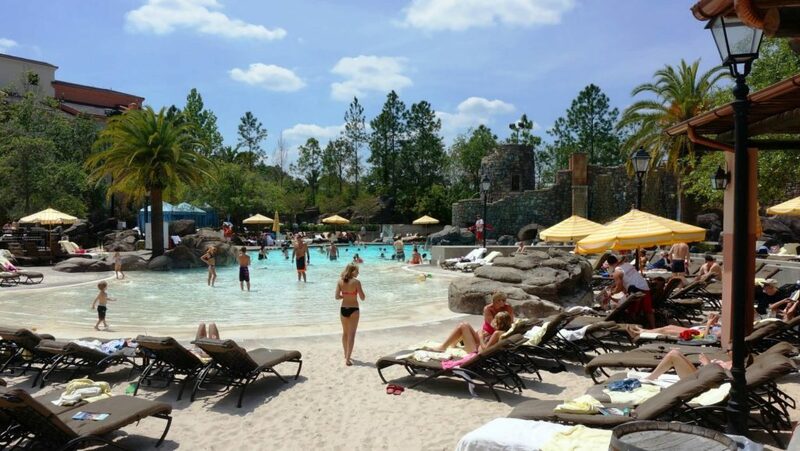 That may have explained the low attendance at the Beach Pool – that or the fact that there are two other pools on property at Portofino Bay Hotel. Whatever the reason, it was the quietest of the pools we had toured so far. When we were ready to leave, we left our swimwear on, put on cover-ups, and headed to Islands of Adventure to hop on the water rides. Finally, one last wet walk through the Wizarding World and Seuss Landing, and we were back at the Royal Pacific pool enjoying another night at Universal. For our final day, we decided to skip the parks and just make an entire day out of pool-hopping (I can’t tell you how necessary this can sometimes be). 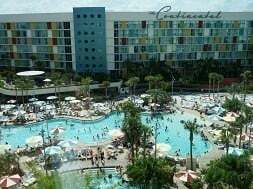 After switching things up by moving our home hotel over to Sapphire Falls Resort, we decided to start our recovery day over at Cabana Bay Beach Resort, since it was the farthest from Sapphire. To get there, you might be tempted to just run across Adventure Way, but please don’t do this! The road is a main thoroughfare in the resort area, so crossing with no crosswalk is extremely dangerous. 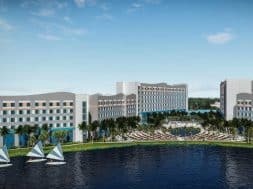 There are signs posted in front of the hotel that will guide you to the Garden Walk, which will safely take you over the road – it’s even lushly decorated with tropical vegetation – and then to Cabana Bay. Despite the minor inconvenience of having to hoof it a bit, the color of the Garden Walk helps transport you not only physically, but also mentally, to the funky vibe of Cabana Bay. 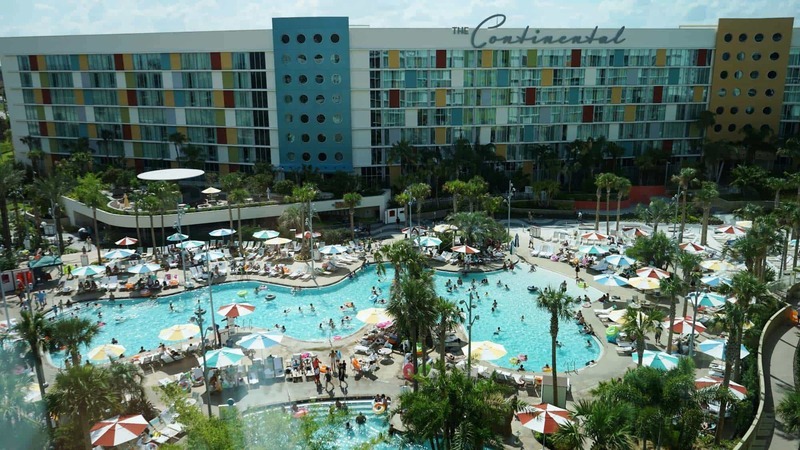 Universal’s ’50s/’60s retro pool area boasts the same colorful fun of the hotel itself. There are two giant pools here, a 100-foot water slide (disguised as a dive platform), and, even, a lazy river. The morning we went was a little overcast, but it didn’t prevent us and the other guests from enjoying the pools and poolside games, such as corn hole and frisbee. When you first walk into the North Courtyard pool area, there’s a greenspace to your right, where you can kick a ball around during the day and where, at night, a poolside movie is hosted. To your left is a pavilion with picnic tables. If you’re coming from another hotel and didn’t bring towels, don’t worry – there are bins around each pool deck and lazy river for you to grab some fresh ones (and return them when you’re done). After hanging out around the pool for a bit, my husband and I grabbed a drink at the Atomic Tonic bar while our kids went to check out the hula hoop contest, which was followed by a match of table tennis. As it was overcast, they didn’t have to wait for a table. It made for a nice, laid-back morning at the nice, laid-back Cabana Bay, which is easily one of the more fun hotels in Universal’s lineup. After the kids had their fill of table tennis, we just put on our cover-ups and headed back through the Garden Walk over to Universal’s newest offering, Aventura Hotel. This newest pool area, like the hotel itself, is very minimalist in design – it’s easily the smallest pool at Universal Orlando – but that doesn’t mean it’s lacking by any stretch of the imagination. As our overcast day continued, the husband and I explored the pool deck while our kids hit the game section, which has a foosball-type hockey game, a pool table, and more table tennis, as well as a waist-high Connect Four game. Once again, they were able to just pick up and play whatever they wanted. Once the sun finally started to peek out, we all took a dip in the pool. It was a bit smaller than the other pools on site, but there was still plenty of room for us and the other guests to hang out in. There’s also a splash zone for younger kids here, and a hot tub, which my husband and I spent a few minutes in to warm up. Afterward, the kids went back to tackle a few more rounds of Connect Four, while my husband and I perused the offerings at Bar Sol, the poolside bar. They offer an impressive variety of regular cocktails, frozen drinks, and mocktails, plus beer and wine, most with a Spanish slant. It was getting to be closer to lunchtime, though, so we decided to wrap it up at Aventura and finish our pool-hopping day at Sapphire Falls. Instead of changing into regular clothes to go to CityWalk or somewhere else for lunch, we decided to just grab a bite at the Drhum Club Kantine in the Sapphire Falls Resort pool area. They offer a nice selection of mostly-Caribbean foods, such as mahi tacos and shrimp skewers, but they also have the usual favorites, like brick-oven pizzas, salads, and sandwiches. You can sit in the small covered dining section and order food or grab some padded lounge chairs and enjoy poolside service that way. We opted to go for the lounge chairs as, now that the sun was out, the pool area was starting to fill up more. As a whole, Sapphire Falls Resort serves up a fun and gorgeous Caribbean vibe with its 16,000-square-foot pool, sand beach, water slide, hot tub, children’s play area, and fire pit (if you happen to be there on a chilly night). It’s the biggest of Universal’s nine pools, and we found it to be one of the most fun, too. There’s even an ankle-deep walkway in the middle of the hourglass-shaped pool, making it easy to get from one side to the other – a nice feature. We also noticed that there is a walkway and gate leading from the Garden Walk right to Sapphire Falls, so if you wanted to hop from Cabana Bay to Sapphire, it’s easy to do so. The gate is located toward the back of the dining area, next to Drhum Club Kantine. After we all were spent from swimming and soaking up the beauty that is Sapphire Falls Resort, we considered checking out the Caribbean Carnival Dinner Show that takes place every Friday, but we were just too wiped out from our day of nonstop pool-hopping adventures. Maybe next time, because we’ll definitely be back! Renting daily lockers made mid-day pool hopping much less work. At $10 to $15 each, we really felt it was worth the price to save ourselves a trip back to our home hotel(s) – after all, time is money while on vacation. It was also great to head out of the parks while the masses seemed to swell in the heat of the afternoon. None of the hotel staff questioned our right to be at any of the pools once they saw our hotel key card. We also used our key card to pay our tabs at each pool. My 15-year-old son preferred the Hard Rock pool. My 13-year-old daughter liked the Portofino Bay Beach Pool the best. My husband and I loved the laid-back island feel of the Royal Pacific and Sapphire Falls pools. 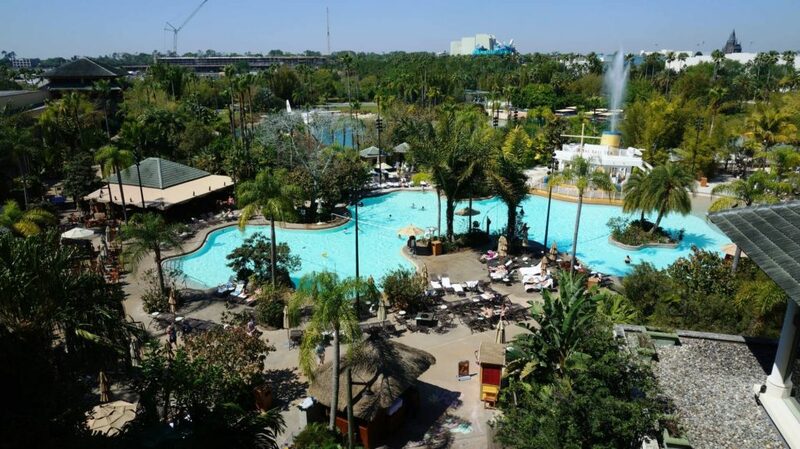 No matter which location you choose to settle in poolside, drink in one hand and Kindle in the other, it is hard to imagine that you are literally a heartbeat away from the amazing theme parks at Universal Orlando. Being able to enjoy all of the uniquely-themed pools was a luxury. Refreshing water, great service, and happy teenagers – it doesn’t get much better than that! Have your own adventures in pool-hopping you want to share? We have tens of thousands of Universal lovers and vacation planners ready to hear them over at our OI Community on Facebook. 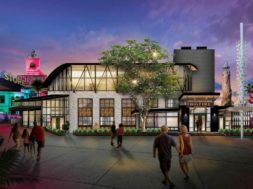 next Regal Pointe Orlando: The best place to watch a movie!